382 pages | 12 B/W Illus. This edited volume bridges the gap between basic and applied science in understanding the nature and treatment of psychiatric disorders and mental health problems. Topics such as brain imaging, physiological indices of emotion, cognitive enhancement strategies, neuropsychological and cognitive training, and related techniques as tools for increasing our understanding of anxiety, depression, addictions, schizophrenia, ADHD, and other disorders are emphasized. Mental health professionals will learn how to integrate a neurocognitive perspective into their clinical research and practice of psychotherapy. 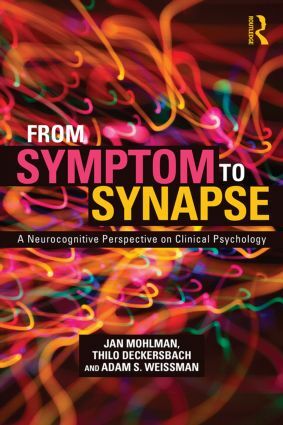 Jan Mohlman, PhD, is Associate Professor at William Paterson University. Thilo Deckersbach, PhD, is Associate Professor of Psychology at Harvard Medical School. Adam S. Weissman, PhD, is the Founder and Executive Director of Child and Family Cognitive Behavioral Psychology, PLLC, in Scarsdale and Manhattan and is on the clinical faculty at Columbia University.